Day 6, Monday, and our 2’ tall 8” wide stem walls were poured; quick and easy. Thanks to the wonderful work of our concrete contractor Ron Colcord and his crew, we were prepped and ready with the wall forms and rebar in the morning, passed inspection with Washoe County before noon, had the concrete poured, finished and curing by early afternoon. Also included in this phase of construction were Simpson bolts buried deep into the concrete walls at each of the ten corners that will hold down our custom welded brackets and the Haven’s walls. Extra 4’ rebar stakes were also added every 4’ that will be bent inward towards the center of the Haven at 90 degrees and act as a fastening mechanism for our poured concrete slab floor. Finally, large hooked bolts were put in within the perimeter of each wall to fasten the future mudsill and plywood to the foundation. The Haven is rising out of the ground and starting to show the beginning of its beautiful form! 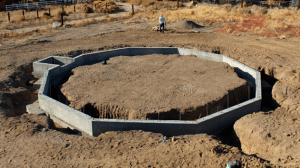 Final stemwalls are similar for concrete slab or raised crawlspace foundations; both appropriate for off-grid, net-zero or green building. Next step: excavating in inside of the Haven and prepping for the concrete slab floor that this homeowner has opted for.Stay tuned! If are a property owner, rural builder, or company needing remote workforce housing and would like to explore more about our custom Haven home packages please Contact Us.